Patali Gur (Date Palm Jaggery), also known as Khejur Gur, is a Bengali winter delicacy and is well known to all Bengali people for its aroma. This Patali Gur is sourced from Joy Nagar in West Bengal. Patali Gur is popularly known as Khejur Gur. This Khejur Gur is used in various Bengali sweets items starting from Rosogolla, Sandesh, Payesh and in various other sweetmeats & confectionery items which are made in winter season only. 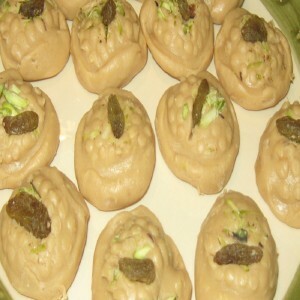 Buy best quality Nolen Gur Karapak Sandesh from Bong Haat. It is a seasonal Bengali sweetmeat delicacy available only during winter (November to January) season in Bengal. Unlike other Bengali Sandesh, this Nolen Gur Karapak Sandesh is made from Nolen Gur gur (jaggery made from date palm tree extract with exquisite taste and aroma) and the taste is way apart from other Bengali Sandesh. This Karapak Sandesh ensures good shelf life for consumption.